Product #20899 | SKU TBC404 | 0.0 (no ratings yet) Thanks for your rating! The black TBC-404 Compact High Zoom Camera Case from Case Logic is customised for your small, compact camera with a long zoom. Why carry a larger, heavier bag when this one is lightweight, durable and compatible? 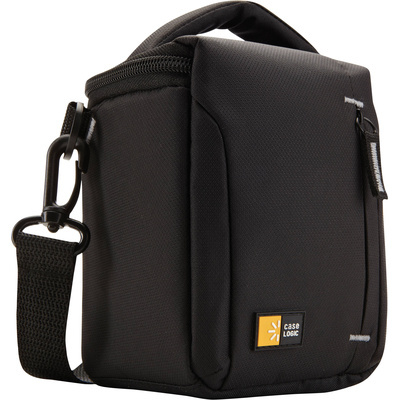 The case is made from Case Logic's Dobby nylon and supported by a padded interior that gently cradles your camera to protect it from the bumps and scratches encountered during daily use. There's an interior zippered pocket for storing an extra SD card plus a front slip-in pocket for your lens cap that always seems to get lost without a dedicated place to keep it. The case is carried by either its adjustable, removable shoulder strap or the top carry handle for when you need to just grab it from the back seat of your car. At only 4 oz, this case won't add much bulk to your shoulder. Its vertical orientation works well when you're navigating through crowds since the case hugs your side. Access to the interior is achieved with dual zippers with pull tabs. The pull tabs work well when you're wearing gloves. With its 25-year warranty and excellent price point, this case is a compact winner when you want a bag to hold a minimum of gear with a maximum of functionality. FAA and airline carry-on specifications are subject to change without notice, please cheque with your airline before designating this case as a carry-on item. Most airlines require carry-on items to have an external linear measurement that is equal to or less than 114.3 cm. The external dimensions of this case add up to 38.9 cm.